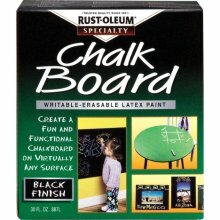 The Pauper's Castle: Steel tub or chalkboard? As promised, here are the instructions for how to turn a galvanized steel tub into a summer entertaining chalkboard piece. Select your container. It can be a vintage one or you can purchase one. These were purchased at Tractor Supply Company. Select the area you want to paint and sand with 240 grit sand paper to rough the surface. This will make the paint adhere better. Clean the sanded area with an ammonia-based cleaner. (important step) I used glass cleaner. Prime the area to be painted with chalkboard paint and/or regular paint with a laytex based primer. 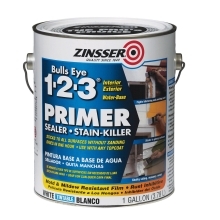 (another important step) Zinsser 123 would be great, but any laytex primer will do. 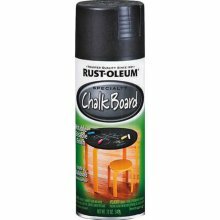 Paint your container with Rustoleum Chalkboard Paint. I used the brush on, but you could use the spray....it's just not as cost effective. Let dry 1 hour between coats. You will need 3-4 coats of chalkboard paint. Once the chalkboard paint is dry, peel off the tape, and then re-tape the area that you would want an accent paint color. Paint 2-3 coats of your accent paint and peel the tape once the paint has set, but before it's completely dry. The lines will be crisper this way. Let the container sit for 3 days (I waited 2), these are the instructions on the can by Rustoleum. 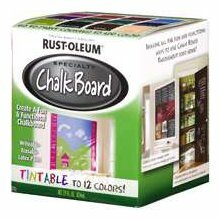 Once 2-3 days have passed and the chalkboard paint is dry, you need to "prime" your chalkboard surface. Place a piece of white chalk on it's side and rub over the entire chalkboard paint area. Then wipe off with a clean cloth. You are ready to start writing! Now you just have to decide what you want it to say! This is the primer I suggested. Chalkboard Paint I used. I used black, but it also comes in the traditional green. This is the spray version I was talking about. Would be easier, but not as cost effective. It also comes in a tintable version. This would be fun for a large project! Great tutorial. I really like the variation in color on the bands. Very decorative. So fun! Great tutorial. I love all the possibilities with chalkboard paint! 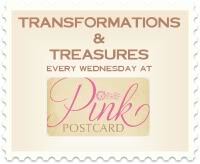 Thanks for linking up to Transformations and Treasures!